Soon after GERB leader Boiko Borissov said that his party – even though it got the largest share of the vote in the May 12 elections – would approach the Constitutional Court to have the elections overturned because there had been illegal campaigning on the “day of contemplation” before the elections, Bulgaria’s Central Election Commission said that there is no legal reason to make such a claim. At the same time, the Bulgarian Socialist Party and Movement for Rights and Freedoms, which appear set for a political deal on a “programme government” to take power after it appeared that Borissov will have no chance of doing so, poured scorn on Borissov’s statement. Central Election Commission head Krassimira Medarova said on May 16 that the legal definition of electioneering was a call to the electorate to vote in favour of one or another political party. Referring to the media reports of comments by political parties on the May 10 raid by prosecutors and the State Agency for National Security on a warehouse housing allegedly illegal ballots, Medarova said that the commission had closely watched the video reports. “Even though there are comments on the forthcoming elections and the parties, there is no electioneering in the meaning of the Election Code,” she said. Socialist party leader Sergei Stanishev said that GERB’s wish for the election be annulled was a striving for chaos in the country. 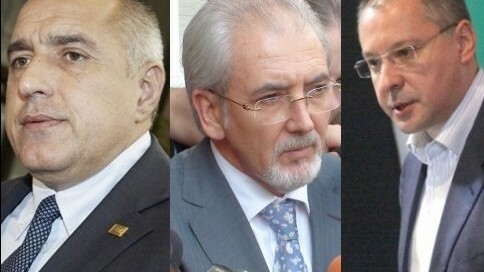 Borissov’s position was “typically destructive, irresponsible and indeed an emotional, defeatist position of a party that claims to have won the elections,” according to Stanishev, who said that the stance of Borissov was strange because the GERB leader wanted the elections annulled and new elections held, but at the same time was prepared to form a government. Movement for Rights and Freedoms leader Lyutvi Mestan said that the GERB demand for the elections to be annulled by the Constitutional Court was an admission of defeat by Borissov’s party. “It leaves the impression that Borissov is behaving like someone who knows that he has lost the elections but it is difficult for him to accept the fact, because he is not just afraid, but terrified,” Mestan said.